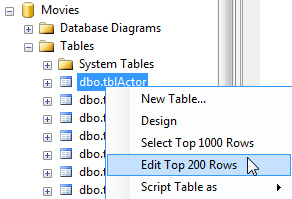 This blog explains how you can get access to all of the records in a SQL Server 2008 table when you try to edit them, rather than just the top 200. 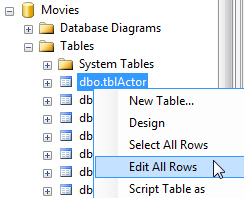 In SQL Server 2008 and onwards when you choose to view or edit the records in a table you can only do so to a limited number of records. By default, when you right-click on a table you can only view the first 1000 and edit the top 200 records in a table. Expand the SQL Server Object Explorer group and click Commands. Change the Table and View Options shown here to any number you like. If you enter a value of 0 you will see all of the records in a table. Once you've done this you can right-click on a table and view or edit all of the records in a table. Now you can view or edit an entire table. It's annoying to have to do this, but at least now you know how to!